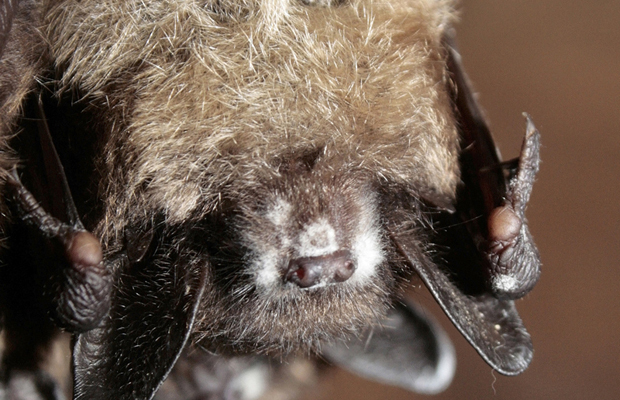 WNS is killing millions of bats across the U.S. and Canada. Bats have a bad rap. They’re ugly creatures of the night that live in your attic. And now you can add a caveat to that list: they’re dying. White-nose syndrome has killed more than 5.5 million North American bats in six years, and it’s only getting worse. In fact, New Brunswick’s bat population could collapse if the spread continues, according to a local biologist. Bats do more than scare us — they eat insects, too. Little brown bats,which have been hardest hit by WNS,eat anywhere from 4 to 8 grams of insects, including mosquitoes, per night when not in hibernation. Because they eat insects, including crop pests, a decreasing bat population could also mean more pesticide spending for farmers, and more pesticides in our foods. Jodi Koberinski, executive director of the Organic Council of Ontario, says that bats are an ally for organic farmers. Member farmers haven’t noticed an increased insect presence on their farms since the fungus hit, but Koberinski says causation isn’t important. Since it was first discovered in New York state in 2006, WNS has spread to 16 U.S. states and four Canadian provinces: Ontario, Quebec, Nova Scotia and New Brunswick. Grey bats are the latest bat species infected by WNS. In Canada, three bat species have been affected; little brown bats, northern long-eared myotis, and the tri-colored bat. 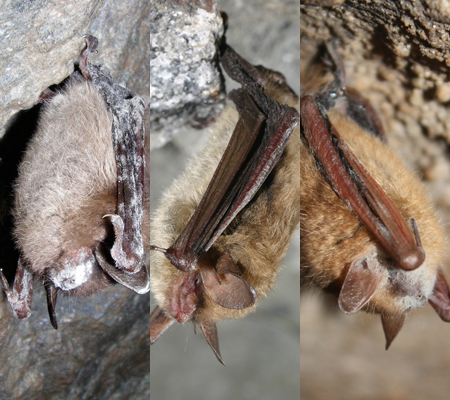 Little brown bats (left), northern long-eared myotis and tri-coloured bats have been infected with WNS in Canada. The fungus doesn’t pose any direct harm to humans but people are capable of carrying the disease on clothing and infecting more bats. WNS can also be transferred bat-to-bat or via any surface. Solutions to cure WMS remain a mystery. “All you can do is keep people out of caves,” says Karen Vanderwolf a researcher at New Brunswick Museum. Vanderwolf was part of the team that first discovered WNS in New Brunswick. In 2011, the year of discovery, they found one infected cave. This year, nine of the province’s 11 known caves were infected. According to her estimates, roughly 6,300 bats have died in the province because of WNS. The ratio of bats dying is near 100 per cent — and those numbers aren’t unique. A Quebec cave saw its bat population drop from 4,500 to only eight. WNS-infected bats have been detected in fifteen Ontario regions, including three this year. Researchers are trying to raise awareness about WNS in order to limit its spread while they look for answers and solutions. If the bats’ genetic diversity is maintained, Forbes says there’s a higher chance the population will rebound. But it’s impossible to track exactly how many bats are dying because of the fungus. The primary way bat researchers and biologists track WNS is by inspecting caves and abandoned mines at the start and end of the winter hibernation. Bats aren’t just dying indoors. Some infected bats leave to get food and die while they’re out. Others are eaten by raccoons. In Quebec, low water levels near the caves means some dead bats are washed away. Quebec has been counting its bat population since the early 2000s–before WNS arrived. The province uses the beam-break system, which counts bats as they enter and exit caves or mines, explains Julien Mainguy, a biologist at Quebec’s Ministry of Natural Resources and Wildlife. But even this method has flaws. All four provinces are asking the public to report any dead bat sightings or “day-flying” bats in the winter. They’re also in communication with the caving community, telling them to stay away from infected sites and to decontaminate their clothing when exiting. The research community at-large is also taking steps to co-ordinate a national plan. An ad-hoc group called Canada’s inter-agency WNS committee was also recently formed. The committee, which is composed of Canada’s leading bat experts, hold teleconferences to update each other on new findings and discuss plans-of-action for awareness and funding. One challenge of addressing an animal disease like WNS is its provincial regulation. There’s no clear-cut role for wildlife responsibility in Canada, says committee coordinator Ted Leighton. In this video Dr. Ted Leighton provides an overview of the devastating disease affecting bats in the United States and Canada. Leighton is also the executive director of the Canadian Cooperative Wildlife Health Centre, the group that first discovered WNS in Ontario in 2010. “The system could use improvement,” he says. One way the Federal government can make an impact is by designating the three bat species as endangered under the Species at Risk Act. In February, the Committee on the Status of Endangered Wildlife in Canada made that recommendation to environment minister Peter Kent. Beyond raising WNS awareness, the designation could lead to research funding. “There are so few examples of diseases of this pandemic scale that we need to study and study now,” Elderkin says. Kent’s press secretary says the minister recognizes the urgency and is waiting for Environment Canada to review the COSEWIC report before making a decision. There’s no time frame for when a decision will be made. A 2011 study estimated bats are worth anywhere from $3.7- to $53-billion to the American economy. According to the study, “Economic Importance of Bats in Agriculture,” having bats in agriculture ecosystems limits pesticide use and crop destruction by insects. “Bats have historically been overlooked by farmers and people because they’re nocturnal and so nobody sees the role they play in pest control,” says Dr. Justin Boyles, the study’s lead author. Boyles says the point of the study was to raise awareness about the scope of the problem and to in turn get agricultural organizations to start paying attention. He’s now planning further research and hopes to get funding from the United States Department of Agriculture. Infected bats are woken from their hibernation because the fungus causes irritation. Bats then use up their energy trying to lick and groom the fungus off, which depletes their fat reserves and causes them to either die or venture outside in search of food, where they later die. Photo: Graham Forbes/University of New Brunswick. If WNS continues to spread, there’s a good chance there will be very few bats left in New Brunswick, Forbes says. While there’s been no calculation in New Brunswick, Vanderwolf says one summer study of bats in Nova Scotia pegged their provincial population at 300,000. But questions still remain over what a decimated bat population could mean for people. “Would insects survive or die of something else? We don’t know,” Forbes says. “You take out five- to six-million bats from a continent, it’s hard to imagine it won’t have an impact,” he says.